A basket that is ripe for giving, this beautiful gift includes both fresh fruit and a potted plant. The charming wicker basket is hand-delivered with favorite fruits such as apples, bananas, pears, and oranges. Colorful and healthy, the basket is made even more special by the addition of a potted plant, that the recipient can keep in the home or office. Food components and pictured flower may vary to ensure freshest basket possible. if ordered by 3:00 pm EDT Friday April 26th. 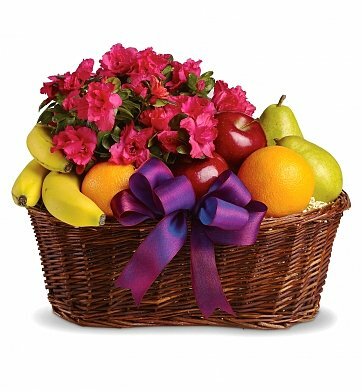 Fruits & Blooms Basket is a hand delivered gift. These gifts are delivered by one of our local design centers located throughout the United States and Canada. Same day delivery is available for most gifts when ordered before the cutoff time. The cutoff time for Fruits & Blooms Basket is 12 PM in the recipient's time zone. Really enjoyed the beautiful flowers and the fruit was fresh and very enjoyable. Thank you very much for the beautiful basket, my sister and nephews loved it. Cookies were left out, but they said we don%u2019t need them. So it worked out great. plus they did a credit on my card for the cookies. Great job everyone. I will use you again. All of the fruit gift boxes that were sent, were received with great satisfaction. Everyone loved their gift! I live in Louisville and ordered the Fruit and Blooms basket for my niece in Las Vegas. She received it the same day that it was ordered, and she loved it. She sent me a picture and I was very satisfied with it. It included a beautiful plant and she said it had a lot of fresh fruit. I sent this to my friend who had just reached 100 days past transplant. She could not stop talking about how beautiful it was! Thank you for helping us celebrate that day! I will be back! Fruit and Blooms Gift Basket. Hello, This is the first time using this site/product and got great feedback from the family we sent this gift too. Thank you for the quality and presentation. Told it was beautiful!! She loved it and said that I'm a sweet person. This item was a 60th wedding anniversary gift for my sister and her husband. And although I have not seen it my sister and brother-in-law are so very pleased with their gift. They have received as well as given gifts through other vendors in the past, but they said they have never seen a gift this well done. They were also impressed with the card that accompanied the basket of goodies. Thank you. Gift Tree is the only company I use for flowers, baskets or gifts to be delivered. You always meet or exceed expectations as far as the quality of the product. This time, after having trouble finding the recipient, you went the extra mile to make sure the gift was delivered in a timely manner and to keep me up to date on the delivery status. Much appreciated, on both ends! Thank you!! Was my first time using this site and was not sure if claim of delivery next day was true. Can't believe that I ordered late at night on a Saturday and it was delivered next afternoon. Great presentation and was told by recipient that it was beautiful and big. I will use this site again. Thank you for asking for my input. I have used this gift as a sympathy gift and as a get well gift and both recipients praised it. They loved the fact that they had the plant to remember their loved one, or to guide them through their "get well" process. It is just enough fruit to share with someone and gives them a little nourishment as well. Sent this to my mom for Mother's Day. She said the fruit was so fresh and the flowers were beautiful. It arrived on time with a beautiful presentation. Great gift for anyone!! My Aunt loved the gift! The upgrade price plus (same-day!) shipping was cheaper than all of the places I checked locally. The actual item was delivered in a wooden, contemporary box with 2 beautiful plants and plenty of fresh fruit. It was a "polished" statement gift that did not reflect the cheap price. Everyone was pleased and I would definitely send this gift again. We ordered this beautiful basket as a sympathy gift for one of our colleagues. I was told by the recipient that they were so impressed with it. The fruit was extremely fresh and tasty...and having the living plant, versus cut flowers, helps them to keep the memory of their loved one. This was given to the wife of one of our retiree's as a thank you gift. She was very pleased. I received the basket the day before the retirement banquet and it was much better than in the photo. I was very proud to present her with this basket of fruit and flowers that would last for a long while. The basket was delivered on time and was filled with great fruit-no filler junk like some baskets. I was proud to send it as a gift and my sister was thrilled to receive it. The family loved the assortment of items in this selection, especially the colorful plant that formed the "centerpiece" of the basket. They exclaimed that the fruit, cookies and candies were very nice to have to share with those who were there to pay their respect after the viewings and eulogies were completed. And, the delivery was right on time and exactly as promised. Nice job!! I'll be back soon!! We got the deluxe and WOW. The family we sent it to went on for 10 mins. about how big and wonderful it was. They said the delivery guy had trouble to carry it. We are happy. Thank you. Jim.